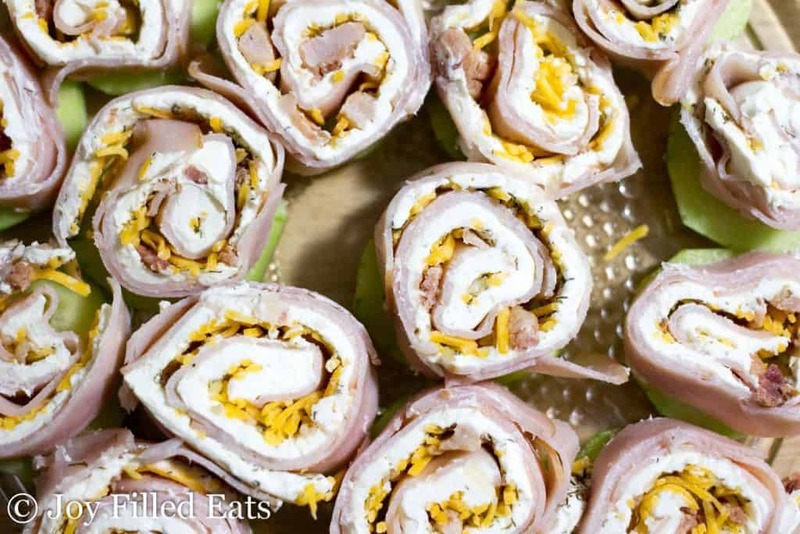 Turkey Bacon Ranch Pinwheels are a crowd-pleasing, five-minute prep appetizer. My kids gobbled these up when I made them for the Super Bowl last week. They have a lot of flavor with only a little bit of effort. I am not a football fan. At all. I tried for a while to watch football with my husband when we were newly married but it’s just not my thing. I came to realize it’s ok to have different interests and hobbies. I don’t need to be a super duper Giants fan to have a good marriage. What I will do is make plenty of snacks for the rest of my family to enjoy during football games. The kitchen is my happy place. Much more than sitting on the couch watching football. When I saw this video floating around Facebook recently I knew I wanted to make my own version. I’m not a big fan of salami or those jarred peppers so I went with a turkey ranch version instead. My trick for recreating ranch flavor is to use garlic, onion, and dill. I really think dill is the quintessential ranch flavor. This is one of my favorite flavor combos if you haven’t realized. I have just a few bacon ranch recipes already. Bacon Ranch Chicken Casserole, Bacon Ranch Cheddar Chicken Salad, Bacon Ranch Cheddar Broccoli Salad, and Bacon Wrapped Chicken Tenders with Ranch Dip. You can have an entire bacon ranch flavored meal. 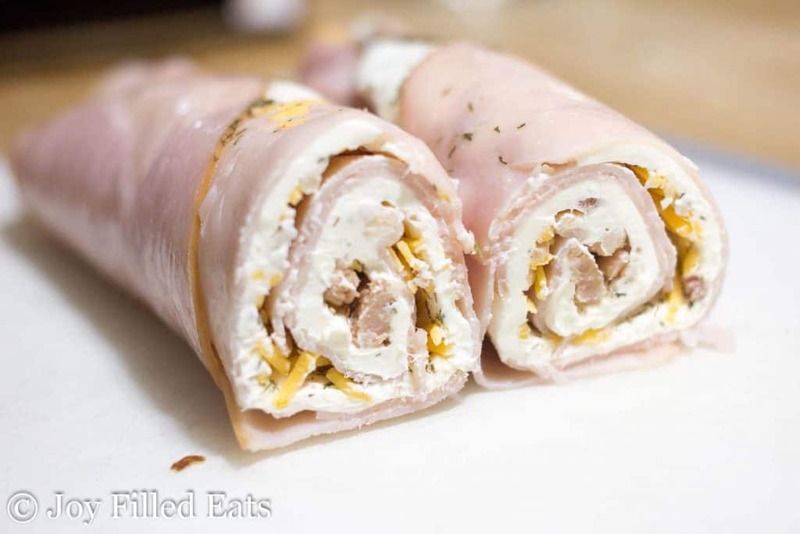 Roll cream cheese flat between 2 layers of plastic wrap. Remove the top layer. Add turkey. Roll up. Roll up some more. Chill. Slice and serve! It is helpful to watch the original Facebook video here. Of course, I picked the part of my island that is stained with a yellow marker to photograph this on. Just ignore the scribbles. Because kids. Put the cream cheese between 2 pieces of plastic wrap. Roll it out until it's about 1/4 inch thick. 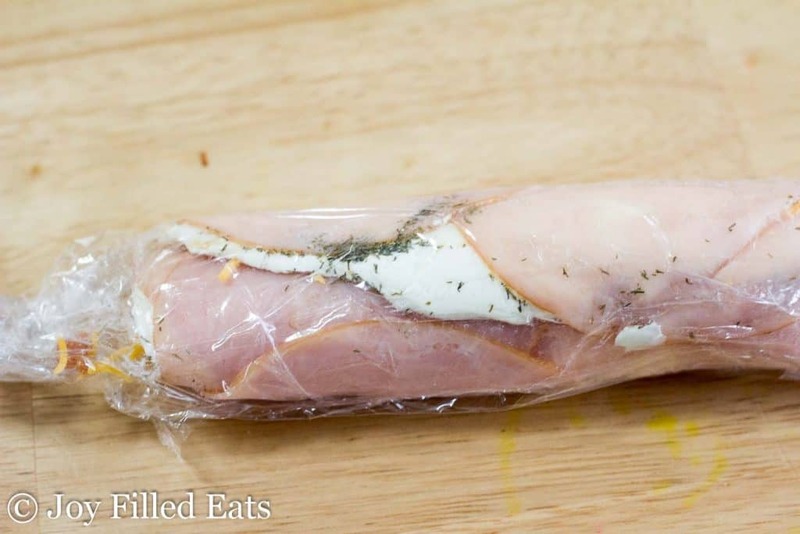 Peel off the top piece of plastic wrap. 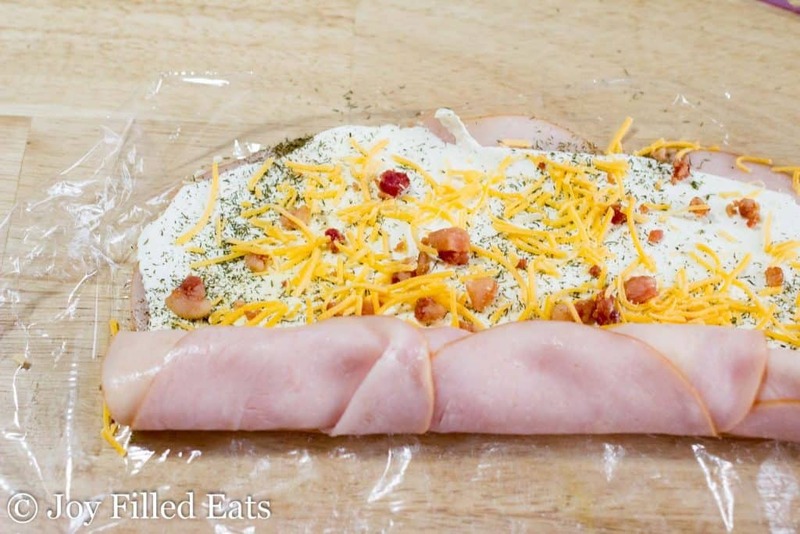 Lay the slices of turkey on top of the cream cheese. Cover with a new piece of plastic wrap and flip the whole thing over. Peel off the piece of plastic that is now on the top. Sprinkle the spices on top of the cream cheese. 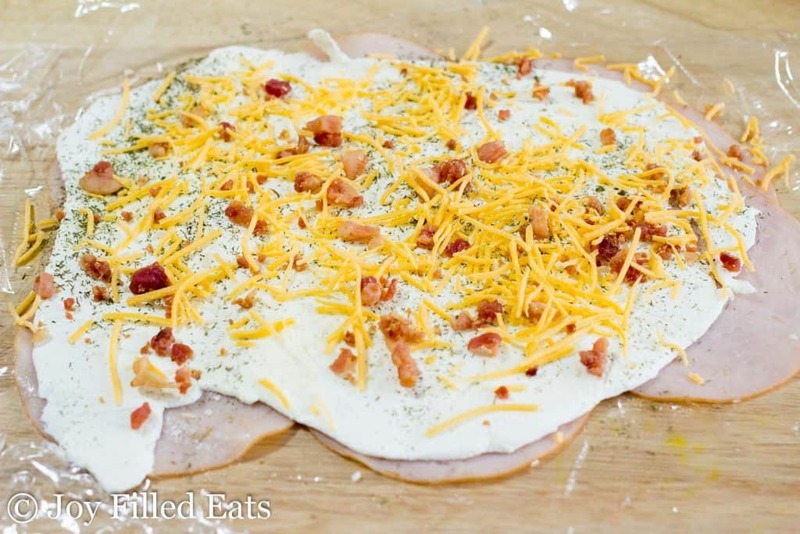 Sprinkle with the bacon and cheese. 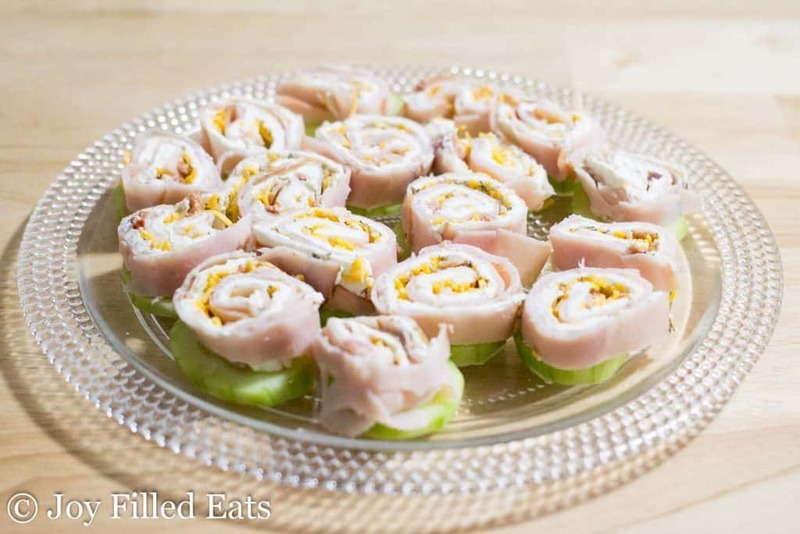 Roll up the pinwheels so that the turkey is on the outside. Refrigerate for at least 2 hours. 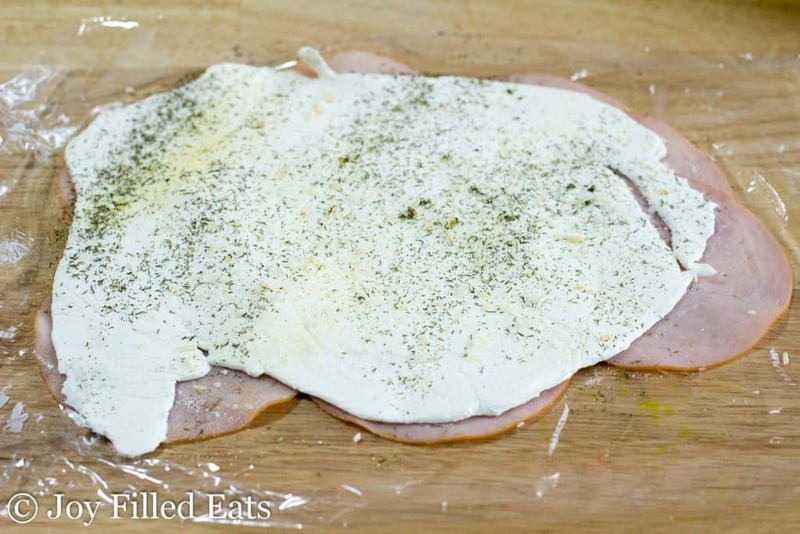 Thinly slice and serve on top of low carb crackers or sliced cucumber. These sound delicious. Perfect for game day, appetizers and after school snacks. You are a genius! I have made various pinwheels before, but never rolled the cream cheese...just spread it on as best I could. Which was never very good. 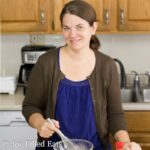 You can roll cream cheese! Who knew!!! If your turkey is fresh they should last 4-5 days. These are a delicious snack! My 3 year old and four year old both enjoyed these as well! Rolling up around a dill pickle would be yummy! 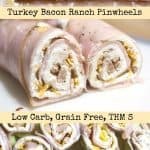 With my husband eating low carb, I'm always looking for delicious, easy-to-eat snacks for him to take to work. 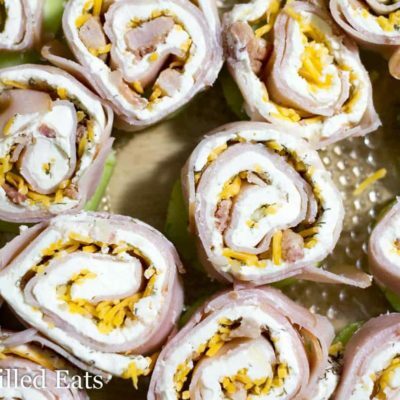 We're both huge fans of bacon and ranch as well so these will be absolutely perfect!! Do you use the dried minced onion or fresh? I use dried. I think fresh may be too strong of a flavor for this recipe. I just love how easy these are to whip up! These are seriously so easy to make! And they are mesmerizingly delicious (I always feel like I'm being hypnotized into just one more by the yummy swirls, lol). What an easy recipe! My family will love these! I'm sorry it didn't work for you. I've had dozens of people make this successfully. Maybe the brand of plastic wrap makes a difference. I used waxed paper/parchment paper instead. I had great success with Glad Press n Seal. 1/6 of the recipe. It depends on how many pieces you get but about 3 pieces. So 3 slices is a serving size, just about? Yes, if you slice into 18 pieces. There are 6 servings so just divide the number of slices you end up with by 6. Thank you! And the calories & nutritional value is based on a serving right? Not total? What kind of turkey did you use? 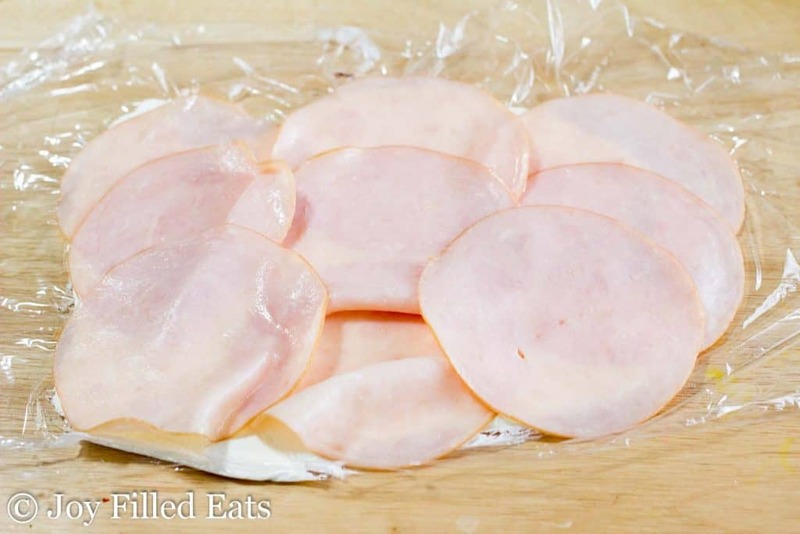 Just inexpensive deli turkey from Costco. I normally use the Costco brand. I'm not sure if it has dextrose but it has 0 carbs. If one wanted to add veggies to this, what would you suggest? I'm new to the pinwheel game and my last few experiments have been a bust. I'm excited to try this one. Maybe baby spinach. I served each slice on cucumber so I didn't both adding veggies inside. I would suggest cream cheese with veggies. Already chopped and incorporated into the cheese. Very yummy!